Jacqui Clevely has been involved with Moor House since her mother first became a resident back in 2005. Jacqui’s mother spent her last two years living at Moor House with Jacqui visiting six days a week – she almost felt as though she lived there too. Fast forward to 2018 and Jacqui has been part of the team at Moor House for more than ten years and says: “I love spending time with the residents at Moor House, I take great pride in treating the people who live there the way I would have wanted my parents to be treated.” Jacqui visits the home at least twice a week for a number of hours. She runs the mobile shop, which sells confectionery, snacks and toiletries to the residents – if she doesn’t have something they would like, she goes out to buy it and takes it in to them. Residents who do not have family nearby really value this support Jacqui gives to them. Jacqui speaks of her volunteering at Moor House with so much passion: “Working and volunteering has changed me in so many different ways – I do things now that I would never have done in previous office jobs. I am much more confident and active. I love making cakes for events at the home, my light sultana cake is a favourite but I also love trying new recipes – I’ve been challenged to make a diabetic cake, which I’m working on! Speaking with residents is so special, they have so many amazing memories to share and for me it brings back memories of when my parents were alive. 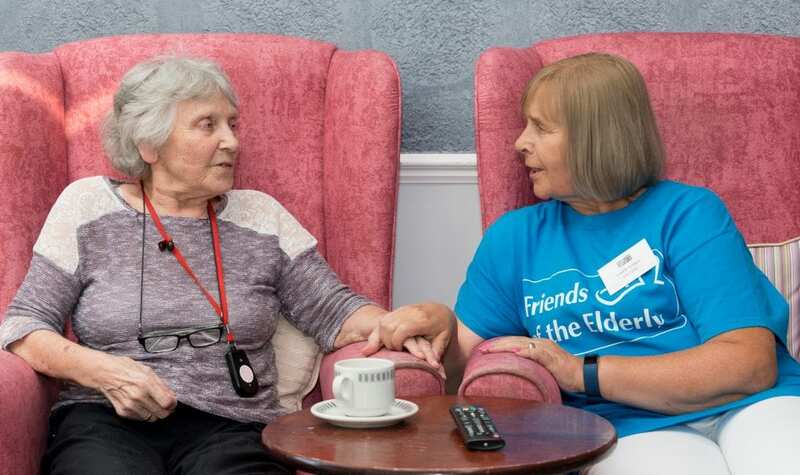 To find out how you can volunteer for Friends of the Elderly’s homes and services click here or call 0330 332 1110.